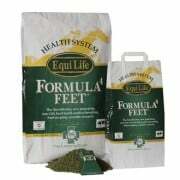 For over twenty years, Emerald Valley has researched and developed the best natural products for the equine industry. 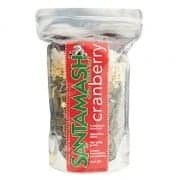 Emerald Valley has a complete line of herbal products, joint and digestive supplements and essential oil topicals. 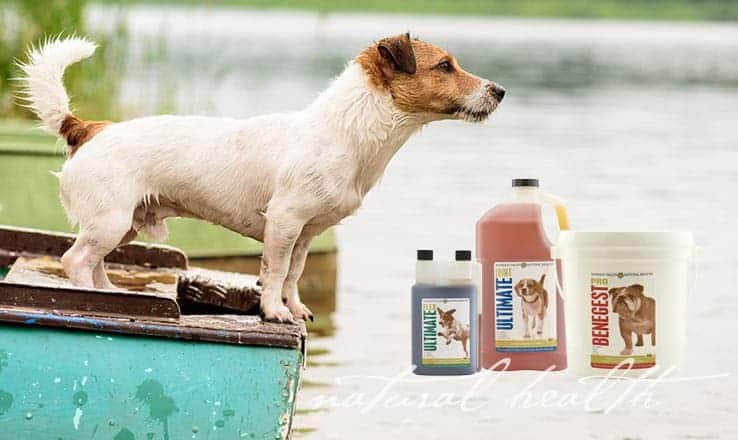 Our commitment to bringing the very best in natural animal health products has led us to reach a broader audience and introduce our dog line of supplements. 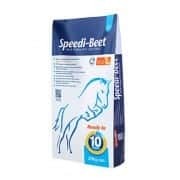 Many of our current horse customers have used our products successfully for many years on their canine friends and we hope you will too! Emerald Valley is dedicated to helping you achieve consistent, positive outcomes for the animals in your care. For the active working dog, show dog, hunting partner, family pet or senior, we have natural options to keep your canine healthy and happy. 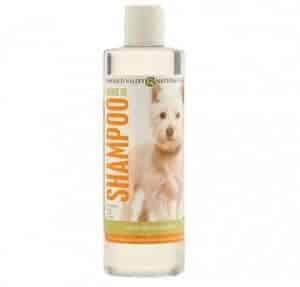 If you need further help in finding the best product for your canine friend, contact us. We’re always happy to help. Emerald Valley is an audited member of the National Animal Supplement Council. Members of the NASC are industry participants committed to the highest current standards of quality in the industry today. 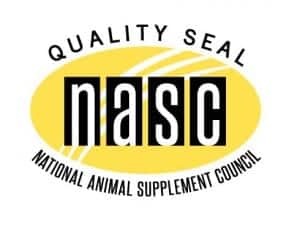 The NASC seal on product labels provides a symbol of quality for consumers with the assurance they are buying products from a reputable company that has completed a facility audit. During normal exercise and activity, the cartilage in your dog’s joints is constantly being broken down and replaced. As your dog ages he/she no longer has the building blocks for maintaining healthy cartilage which can lead to inflammation and discomfort. Ultimate, with Glucosamine, provides the building blocks for healthy cartilage, and MSM to support circulation and muscle recovery. 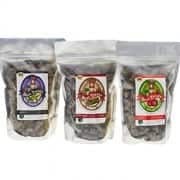 Devil’s claw is added to manage discomfort and soreness, along with Vitamin C to provide antioxidants that may remove damaging free radicals. 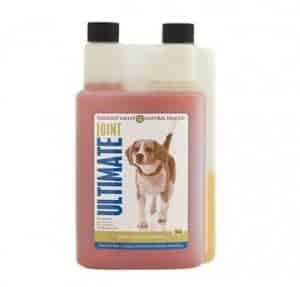 Ultimate is a combination of specific herbs and nutraceuticals to help support your dog’s joints, naturally. Your dog works hard for you! 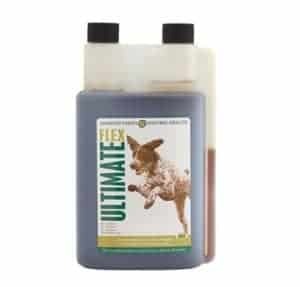 For the dog that works daily, the herding, hunting or agility dog, Ultimate Flex is the natural choice for muscle recovery and joint health. Ultimate Flex main ingredients including glucosamine, hyaluronic acid and MSM, support joint mobility, while the addition of aronia berry helps sustain aerobic performance and normal muscle recovery. 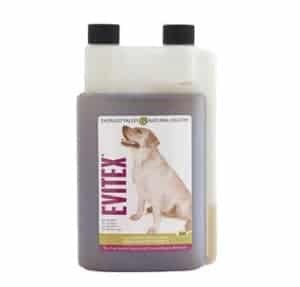 Ultimate Flex is the ideal combination of herbals and nutraceuticals to keep your working dog comfortable, active and happy. During regular exercise your dog’s cartilage is constantly broken down and replaced. As he ages, he may no longer have all the building blocks to maintain healthy cartilage. Frequent exercise and activity can cause the joints to fall behind in producing cartilage, especially in older dogs, leading to inflammation and discomfort. Glucosamine helps maintain the health and resiliency of joints and connective tissues, while MSM supports circulation and muscle recovery. Hyaluronic acid (HA) an important component of joint fluid, provides cushioning of joints. HA supports mobility, promotes healthy cartilage function and healthy tissue. Aronia berry has been found to contain more antioxidant power than any other fruit or vegetable, supporting circulation and normal blood cell function. The large amount of phenol in aronia berry supports healthy tissue and cells, and promotes normal inflammatory response. 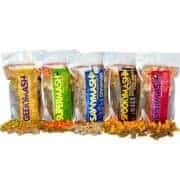 Ultimate Flex supplements what your dog’s body may use while he’s hard at work in order to maintain healthy joints and support muscle recovery, naturally. Benegest PRO, a complete profile of prebiotics and probiotics, helps support all three stages of the digestion process. Without prebiotics, probiotics are rendered ineffective and will eventually die off. Benegest PRO contains the probiotics needed to promote a healthy gut and the prebiotics to maintain probiotic activity. 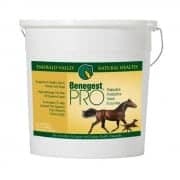 Benegest PRO may support enzymatic breakdown of feed, and maintains the vitality of the absorptive surfaces; it may also help optimize the utilization of fiber. While you try to feed your dog the best diet, if your dog’s gut is out of balance, he may not be getting the most out of his feed. 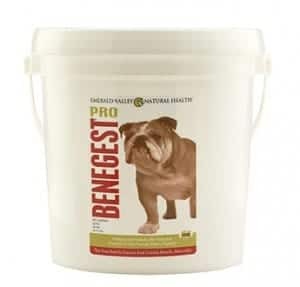 Benegest PRO, with the necessary combination of prebiotics and probiotics, along with yeast and enzymes supports the whole gastro-intestinal tract, optimizing vitamin and nutrient absorption. Added enzymes may aid in the breakdown and utilization of nutrients. Yeast, containing Vitamin B, helps in managing separation anxiety and stress. B vitamins burn quickly during times of stress. 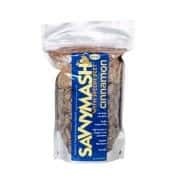 Yeast is also high in antioxidants to help maintain a shiny coat and skin health, as well as supporting the immune system. The natural benefits of going PRO are felt from wet nose to wagging tail! 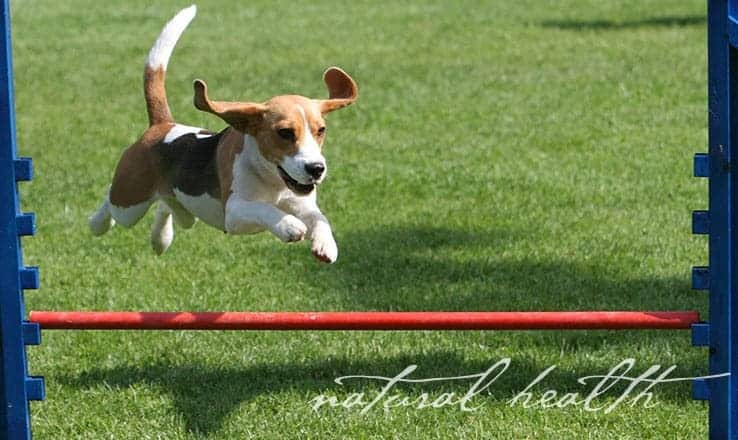 Large or small, all dogs need to be active in order to stay healthy and fit. With an active life comes stress to the body and stress can compromise your dog’s immune system. 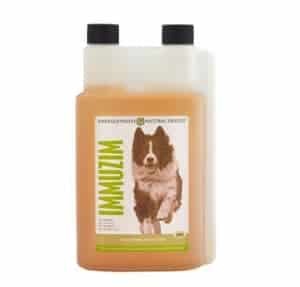 Immuzim, containing two species of Echinacea (purpurea and angustafolia), promotes a normal, healthy immune system. Changes in surroundings, a course of antibiotics, dentistry, travel, extensive training, seasonal allergies and kenneling may compromise the immune system. 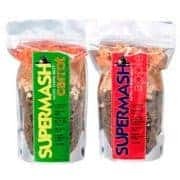 Introducing Immuzim at the first signs of discomfort or stress has the potential to support the immune system and help reduce the negative effects of stress. Immuzim may support respiratory health for better breathing, support blood cell and tissue health, as well as support skin and urinary tract health. Hormones are the body’s messengers, controlling most of the body functions. From the simplest function of hunger to the more complex reproduction, to development and growth as well as emotions and mood, hormones tell the body systems what to do in order to properly function and keep the body healthy. If hormone production is out of balance, the whole body will be out of balance. The pituitary gland is the messenger responsible for sending signals to the other glands, telling them how much hormones to produce, whether the body needs more or less at any given time in order to achieve the optimal balance. Ongoing research indicates the many benefits of chasteberry in supporting the pituitary gland, and in turn, supporting the many functions that your dog’s health relies on. 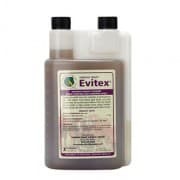 Evitex, based on chasteberry, is the ideal natural supplement to promote healthy skin and coat, normal hair growth, healthy blood flow and detoxification, as well as maintaining healthy insulin/glucose levels. Evitex supports normal emotional balance and helps maintain normal disposition. By supporting hormonal balance, metabolic function, healthy digestion and the optimal function of reproductive health, Evitex promotes long-term health and may help reduce the potential negative effects of stress. After a session of playing ball, a day of hunting or an afternoon hike, even the young and most active dog can show signs of stiffness and discomfort. BTB Plus, based on Devil’s Claw, supports the body’s normal inflammatory response and maintains normal physical well-being. 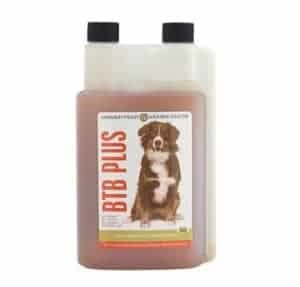 BTB Plus is an ideal supplement for all types of dogs to use when signs of discomfort are noticeable and may be used long term. Ease discomfort, support muscle recovery, cartilage and joint health with BTB Plus. Every dog owner can admit that they’ve complained about their house smelling like dog or the dreaded wet dog smell that all dogs have! Emerald Valley has created a shampoo with orange oil, a powerful cleanser, purifying agent and deodorizer. Orange oil benefits are numerous including protecting against seasonal and environmental threats, taking away itching sensation and cooling the affected area, stimulating blood circulation and may provide relief from inflammation. Orange oil is also an antiseptic. Orange oil has been found to help relieve stress and anxiety while promoting relaxation. It can be uplifting to both the mind and body. Orange Oil Shampoo has added lanolin, nature’s best moisturizer, helping to restore and maintain natural moisture balance, elasticity of the skin and may promote normal hair growth. The natural combination of lanolin and orange oil make this shampoo good for the skin and the soul.